IMG_3034.JPG, originally uploaded by arahbahn. As you can deduce from the photo taken today, today was a fine day for blooming and for getting outside for some activity. I am so grateful not only for the hospitable weather, but for the hospitable air. Maybe I’ve seen too much sci-fi or played too many recent XBox zombie games, but I am so glad to not be living on a spaceship or underground on a planet, with no open air or skies or wind. So, I had a good run today. Eight miles, pavement miles, in the neighborhood. I was overdressed for the run but not for the cooldown. It’s not quite forsythia time, so a run doesn’t really afford a lot of flower eye-candy unless you stop to bend over and look at crocuses or tulip-leaf tips. The sidewalks are full of iceberg-gunk. But ahhh, the sidewalks were also full of sun and other people enjoying the outdoor day. My accompaniment on the iPod today was two recently purchased albums, from Vampire Weekend, and Lady Sovereign, in that order, and until about halfway through the Lady Sovereign album, it was working. Right about when my quads were cooked, was when I needed some disco: Michael Jackson’s “Don’t Stop Til You Get Enough.” Why a song that brings me back to shooting the duck at Skate King is what got me through the last mostly uphill mile, I may never fully understand, but hey, it is what it is. And yes, that song is on my “Happy Happy” playlist. The music for Thursday’s 4.5-miler was Chemical Brothers’ “Exit Planet Dust.” From beginning to end. 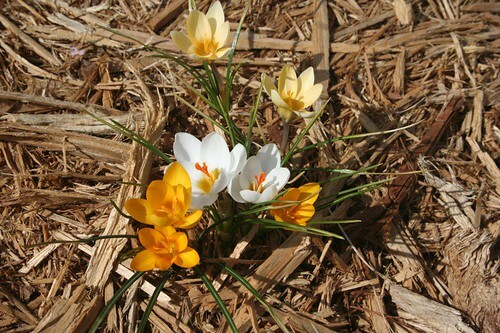 Oh how I wish I still had crocus (crocuses? croci?) in my yard. The squirrels keep eating them. Thus far, the varmints have beheaded just one white crocus. And left the flower right there. VANDALS! “Don’t Stop Till You Get Enough” is one of my favorite pick-me-up running songs.